It has been almost half a year since they restarted their activities and on this day in June 2011, the two of them came to Costa Del Sol of Andalucia in southern Spain. Shooting the duo’s first pictorial book in this 5 days 4 nights trip around three cities. Different from Changmin who always sets his own pace, Yunho’s character to be adaptable to the surroundings was observed right from the first day. This is the analysis of Yunho the leader who possessed the passion since their debut to lead his group to the peak. Though with a ‘poker face’, Changmin’s innermost is as passionate. Last summer, when the two stepped on the stage of SM TOWN as Tohoshinki, the uneasiness and pressure immediately transformed into their own exploding motivation, betting on their pride as Tohoshinki to arrive on the stage once again. Thinking back on that day, Changmin said, “Standing on stage, my legs kept trembling.” Probably the reason behind the trembling was the eruption of passion for singing due to the suppression of it during their activities hiatus that can’t be helped. 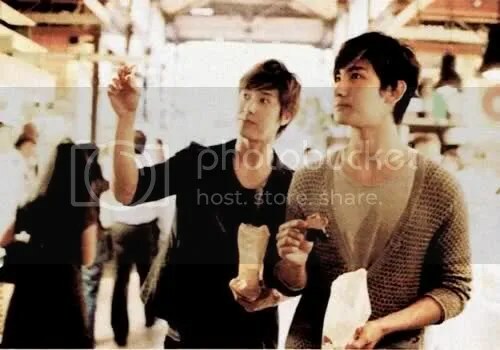 Changmin: Honestly, how fans and people who understands Tohoshinki think and what were their worries… that was probably the most nerve-wrecking stage ever. But the moment when I got off the stage, I heard the enormous cheer. “I am Tohoshinki”, “It’s very good being Tohoshinki.” I think this is the unwavering truth. As I regained my confidence, I was not that unease and worried during the restarting of activities this year. “Sorry for making everyone waited for so long.”, “Shall show everyone our abilities,” such stance we held. Simple and without losing myself, my thinking that is. Though I said it like this, during the decision to appear on the television program ‘Music Station’, I naively thought that appearing on such a famous live telecast music program, we would probably be chided that “after becoming as duo, there’s incompetency.” However, we “cannot have such negative thoughts.”, “We have to let them see our abilities.” I still remember how Yunho and I were encouraging each other at back stage. After the successful performance, I was relieved at the relative non-existence of negative judgement. Probably, after saying “Let’s go!” and the exchange of glances with Yunho, I have been maintaining such ambience for the following six months. I was holding on to such thoughts. After the decision to carry on the name of Tohoshinki as duo, Yunho started to fight against his own uneasiness and pressure, living everyday in a state of self-doubting. Yunho: After becoming the leader, I had the habit of considering things as a leader and not based on own’s feelings. There were times I’m being willful when considering things too. In fact, things to change, things not to change, all these have to be digested and it wasn’t easy. However I had the reaffirmation of “It will all work well with Changmin as a duo” during the summer event. To say it as a new beginning, it can also be said as a “risky beginning”. It naturally became an exciting daily motivation. Compared with before, everything seems even more important now. Ever since being an artiste, whenever there’s any good results, there would be unawareness and tinge of treating it as a norm. However right now, it felt as though I was caught in a sudden fall and then rising up, a feel of neither here nor there. As a duo Tohoshinki, restarting from 1, but have to climb to the top faster than before. As we have the techniques and experiences, we gained new feelings through the past experiences. It can be say that it’s the feel of being a new artiste who is not exactly “new”. Previously as a leader, I would move forward with a cautious mind of “how this would turn out to be”. Now as an artiste, I do my best with singing and left the rest to the hands of the audiences. I’ve became more laid-back. Staff also mentioned that the unique glow has appeared and I felt that I am currently en route to being a meaningful artiste. The two of them evolved through a surrounding of pessimistic criticism and it was not easy to rebuild that motivation. Because of that, their heart and mind during the hiatus were not gaugeable. The kinds of difficulties they have been though, the story would be depicted through this pictorial book. Changmin: Recently I have been told that my looks changed the most. I did made a comparison of the photos when I just debuted, it indeed changed a lot compared from a few years ago and now. I don’t really know how it changed. Probably it’s my heartfelt matters portrayed on my face? Yunho said it restarted from 1 but I don’t think so. When you have nothing, in order to portray a new look, one can only believe the 8 years (since debut) and oneself. Therefore I don’t think it started from 1. Indeed many things changed. When two people was bearing the whole stage, if we had felt that the stage is empty, the audience must have felt the same relay of our feelings too. Therefore we worked hard to not be like that and can only do that. If I felt that I was good in the past and to show that to the audience, it would be sorry to the audience and I really don’t wish to be like that. In fact, compared to others, it’s me who doesn’t want to acknowledge this. No matter what chance it is, this is the road I chose. Braving it all for this correct route, if you feel that it’s correct then go ahead and do it well. Then, I hope to show the world that what I have chosen is correct. This is my biggest motivation.